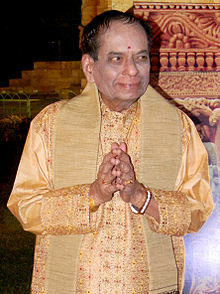 M. Balamuralikrishna (Telugu: మంగళంపల్లి బాలమురళీకృష్ణ) (born July 6, 1930) is an Indian Carnatic vocalist, multi-instrumentalist, playback singer, composer and actor. He [Guru Parupalli Ramakrishna Pantulu gaaru] would take care of me. He focussed only on teaching me and never on performances. He never cared about popularity and wealth. However, I am not like that. I perform and give my listeners a tough time. They think this fellow is not good. He does not follow tradition. I provide them with food for talk and thought. In: Interview by Prince Rama Varma There's no one way to teach., The Hindu, 4 March 2006. There isn't one specific way of teaching. It varies with each student and his/her ability to grasp what is being imparted. Every student has a different purpose for learning. Some think they will get a chance to perform if they learn from a senior musician. Some even ask me to recommend them to sabhas. But I don't. I firmly believe that opportunities should come on their own. But rarely do we get students who are only interested in learning and expect nothing else. One should be passionate about the art if one is to scale heights. In: Interview by Prince Rama Varma "There's no one way to teach". It is only rigorous training and in depth study that make music mature into the realm of the classical. In: Staff Reporter,Mangalampalli can't wait to come home, The Hindu, 1 March 2003. Classical music is a perennially flowing river and nothing can affect its flow. No one needs to worry about Indian music. It is forever. In: Staff Reporter, "Mangalampalli can't wait to come home". I will render whatever Lord Siva makes me render. I never plan for my concerts. I render what comes. Our arts, particularly music, are more livelier than any sport. I play with my `raagas.' And there is no defeat here. Only victory for everyone - singers, listeners and the music itself. In: Staff Reporter, "Mangalampalli can't wait to come home"
On his singing on the occasion of an India-Pakistan cricket match. I like to take things easy. I don't constantly think about music. I never plan concerts, practise or even hum. When I go up on the stage, music courses through me. My family members attend my concerts because they do not hear me sing at home. I have entrusted you [Prince Rama Varma] with the task of popularising my style of singing among others, especially in foreign countries. I have heard some of your foreign students sing my compositions and was surprised. They sound better than many Indian students. I want to be known more as a composer than as a musician. You are now making this happen. I have performed with British musicians. I have sung Rabindra Sangeet and French numbers too. Most often I include local flavour in my concerts to connect with people. In: Chitra Swaminathan He defines ‘style’ as tradition, The Hindu, 4 January 2008. Style. It varies from person to person. Without it music will be monotonous. In: Chitra Swaminathan "He defines ‘style’ as tradition". We are getting carried away by the on-the-move musicians. Most of the Carnatic concerts abroad are being organised by NRIs. The defining moment is when an artist is invited to a foreign land and applauded by the foreign nationals. They should forge artistic alliances and find new audiences by introducing people of other nationalities to our arts. Everything I did was deprecated by the media and others. I think I derived my strength from it. There was brouhaha over my singing my own compositions. I wondered why I cannot choose words to express myself. That’s what Tyagaraja did. He described Rama the way he saw him. Ironically many of my works are now being used by musicians and dancers. It’s heartening though. I never expected to reach where I am today. I learned music without knowing it will one day become my calling. As a mere fourteen-year-old child he composed songs in all the 72 Melakartha Raagas, which form the very backbone of the South Indian System of Raaga Music. Prince Rama Varma in: Murali And Me: A tribute by Prince Rama Varma, Webindia123.com. He was one of the earliest South Indian Classical w:MusiciansMusicians to perform abroad. He has acted in films, sung for films and even scored the music for films. Apart from his own compositions numbering more than two hundred, he has breathed life into compositions of other composers whose original tunes were lost in the sands of time like w:Narayana TeerthaNarayana Theertha, Annammaachaarya, Purandara Daasa, Kaiwara Amara Nareyana, Kaiwara Amara Nareyana, Sadasiva Brahmendra, Bhadraachala Raamadaas and Maharajah Sri Swathi Thirunal. Prince Rama Varma in: "Murali And Me: A tribute by Prince Rama Varma". I have the honour to inform you that the Minister of Culture and Communication, Renaud Donnedieu De Vabres, has conferred on you the award of Chevalier des Arts et Lettres (Knight of the Order of Arts and Letters). This award honours those who have distinguished themselves in the field of art and have contributed to spread of culture in France and throughout the world. Dominique Girard, French Ambassador to India in: French honour for Balamuralikrishna, The Hindu, 3 May 2005. Balamuralikrishna had made the country proud with his artistic imagery and outstanding performances of high order in Carnatic music. He enthralled classical music lovers and earned international laurels to motherland [India]. An enduring legacy of Balamuralikrishna is the wider accessibility of classical kirtanas to the public. Many of his contemporaries tend to treat classical and popular music as watertight compartments. Garimella Subramaniam in: A musical colossus, The Hindu, 6 July 2004. The real issue underlying these controversies appears to have been a challenge to his philosophy of music; nay, that of the Trinity. 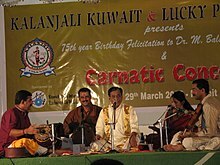 Balamuralikrishna has long held that Carnatic music today is an entity outside the strictly religious domain. He remarked once that those who believed that concert singing denigrated the essence of Carnatic music should confine their singing to puja rooms. Garimella Subramaniam in: "A musical colossus". With all awards and accolades at the international level and his outstanding contribution to classical music, his appeal was not restricted to purists or the elite connoisseur. He endeared himself to the public at large by his tasteful rendering of light music and film songs. Jayalalithaa in:Balamuralikrishna deserves Bharat Ratna: Jayalalithaa, Thee Hindu, 26 Jul y 2005. I would like to learn Carnatic music under his tutelage and become such a great singer that my Guru will say `sabhash' after hearing me sing. She conferred the title of `Gandharva Gana Samrat" on him at the function organised by "Vipanchee." Jayalalithaa in: "Balamuralikrishna deserves Bharat Ratna: Jayalalithaa". This page was last edited on 8 March 2015, at 18:05.